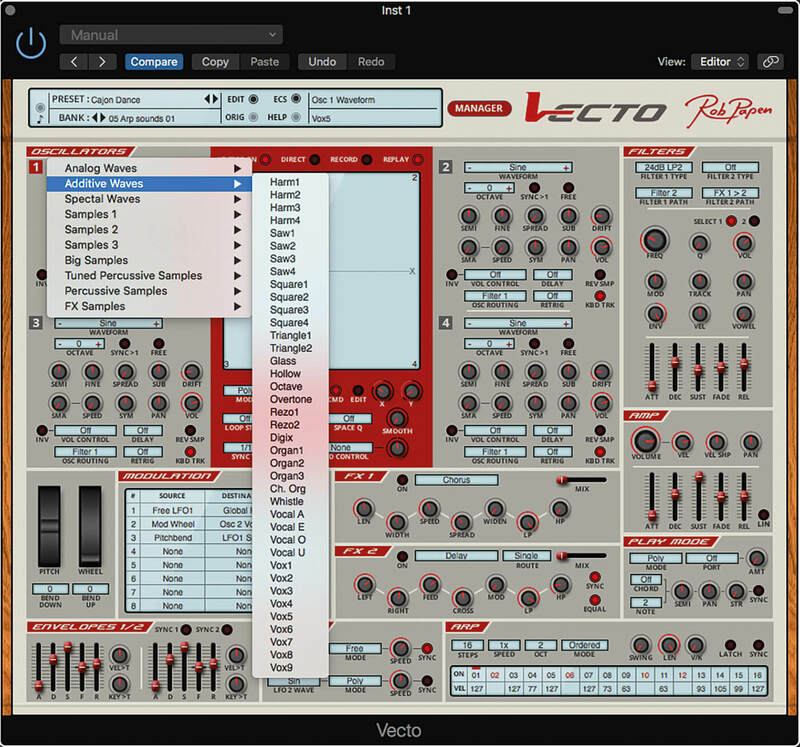 It’s always great to find synths that perform well across the board, and with a very healthy list of specs, the new Vecto might just be that next tempting synth plug-in. 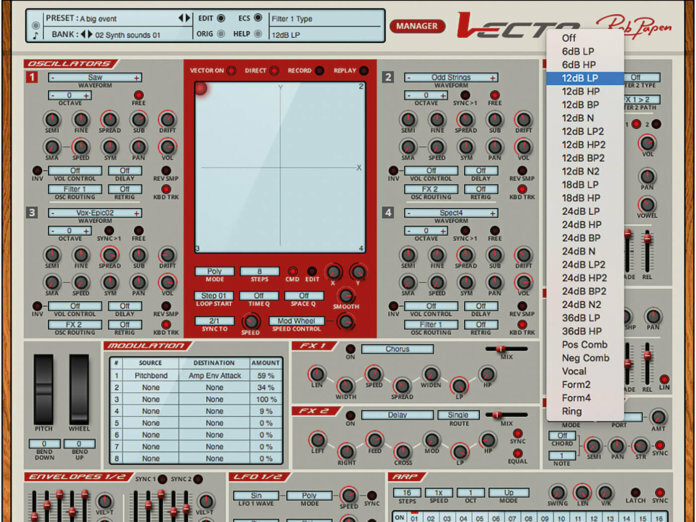 What sets Vecto apart from any of Rob Papen’s prior forays into the vector world is the depth of sonic potential you can reach with it, and also the ease with which you can get at parameters. So let’s start with the look and feel of Vecto, which by usual Papen standards feels quite plain in visual design. This is not a negative point, but more that it just feels a little more strait-laced and easy on the eye, unlike some other Papen synths which have been either very dark or contrastingly bright in colour balance, sometimes making them a little difficult to see operationally. Vecto is calm and clear, almost magnolia, but underneath that calm Clark Kent-like fascia lies a sonic powerhouse. The front end of Vecto is centred around four oscillators, all with the exact same functionality. This extends from a vast array of subtractive analogue-styled favourites, through to additive and spectral waves. These seem fairly logically organised; access is via a drop-down, or it’s possible to click through them, one by one, which in the case of the additive waves results in a sequence of extending harmonic overtones. Previewing is immediate and before you know it, you’re into the realm of samples and effects-based tones, with some being more usable than others. These can be fairly lightweight and digital in construct, including numerous glass, bottle and pan flute tones, which may sound a little dated in isolation, but can actually end up being very useful when placed contextually with other more meaty partials. The FX tones are quite abstract, and similarly lightweight, but the offered percussive tones are really great for adding an abrupt front end, or for recreating the sinusoidal bass tones that have been something of a Papen calling card in the past. It’s a testimony to Vecto that although my first clicks are to locate the presets and have a quick scout around, it takes about 30 seconds for me to head to the oscillator section and start digging deep. I find myself in here for a considerable amount of time before I start to realise an hour has passed. The presets are quick and immediate, with helpful categorisation, either from the selection window at the top of the screen, or the incredibly sensible Manager section, where everything shifts into categorical order. Heading back to the oscillator section, and you’ll find all the usual controls open to manipulation, which include semitone and fine-tuning, volume, panning and a spread function, which thickens up the chosen wave and is surprisingly effective. There’s also a sub-oscillator per oscillator, which offers a simple sine or square wave, one octave below the fundamental pitch. Once you’ve added all of this up to the power of the four oscillators, that’s a very hearty sonic stew which can sound deep and weighty, or light and glassy. The fun really starts when you begin to enlist the central vector control. In its most simple guise, this can be used to act merely as a method of balancing the four oscillators, but by hitting the record button on the Vector panel, you’re invited to draw in patterns, which can be replayed at various speeds, as a single pass, looped, or even set to trigger at various points along the drawn curve. Apart from the obvious swell from one partial to the next, the movement that can be created here is quite beguiling, with an almost Wavetable sense of creation and growth in timbre. Placing a series of harmonically rich partials in context, the movement from one to the next is beautiful, even before moving to other areas of Vecto to refine. 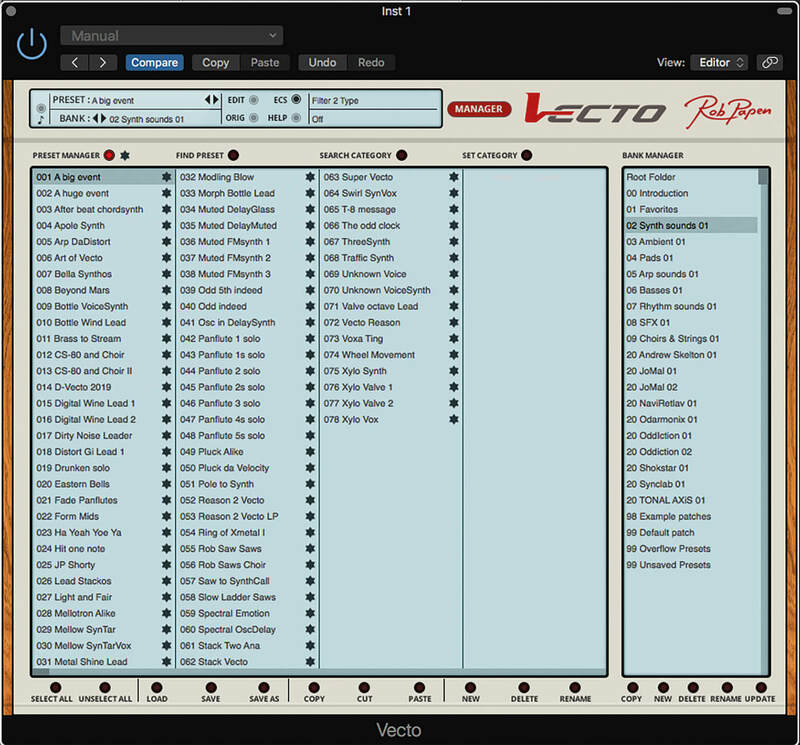 Vecto offers two selected filters, which can be used in series or parallel, from a vast choice of 28 different types. While the majority fall into the more usual subtractive camp, there’s considerable choice. Low- and high-pass versions predominate, with a healthy smattering of band and notch filters, too. All are open to varying pole-type, from 6dB up to 36dB. These sound wispy, classic and contemporary and offer everything you might expect. But for my money, the interest really piques when you begin to deploy the more unusual filters. Vecto offers a positive and negative comb filter, which embraces some extreme sync-like tones begging to be controlled via the associated five-stage filter envelope found immediately below the main cut off and resonance controls. Add this quotient alongside the Vector movement, and your edited sounds simply come alive with movement and interest. Also in the filter category is the Vowel filter, which has always been something of a Papen favourite for me. It sounds beautifully throaty, and a quick visit to the central vector control and the modulation matrix below immediately had my timbre bristling with vocal and harmonic goodness, while the ring-modulated filter sounds superbly harsh, stylish and contemporary. The big problem we have here is that Vecto has so much power onboard, it’s almost impossible to cover everything in a single review. Other important elements that are deserving of mention are the dual envelopes (which are in addition to the filter and amplifier envelopes), the arp/sequencer control, hugely versatile modulation matrix and the rather useful and very good onboard FX section. It’s absolutely full to the brim with great functionality, which is very easy to access. The only moment where I raised an eyebrow was with the speed and shape of the envelope, which somehow doesn’t always feel natural, but this is something you’ll probably only notice with the FX switched off. You have to hand it to Rob Papen, these synths really do deliver. This is testimony to the company’s continued development and enhancement of its product range, which Vecto is a worthy addition to. Placing the vector calling card to one side for a moment, we have to just consider exactly what Vecto offers as a package, and without doubt, it’s pretty comprehensive. The large number of timbral starting points and huge filtration options are appealing, but factor in the X/Y vector pad with real-time motion, along with the modulation matrix, and it’s an absolute Aladdin’s cave of timbral possibility. This is backed up further by four envelopes, sequential options and a considerable FX section, so when you add it all up, it’s not only a powerhouse, but it also offers great value. To be fair, this is often the case with Rob Papen software. My favourite aspect of this plug-in, though, is the vector element, with the ability to easily program and recall movement, to create real sonic interest in the sound you create. 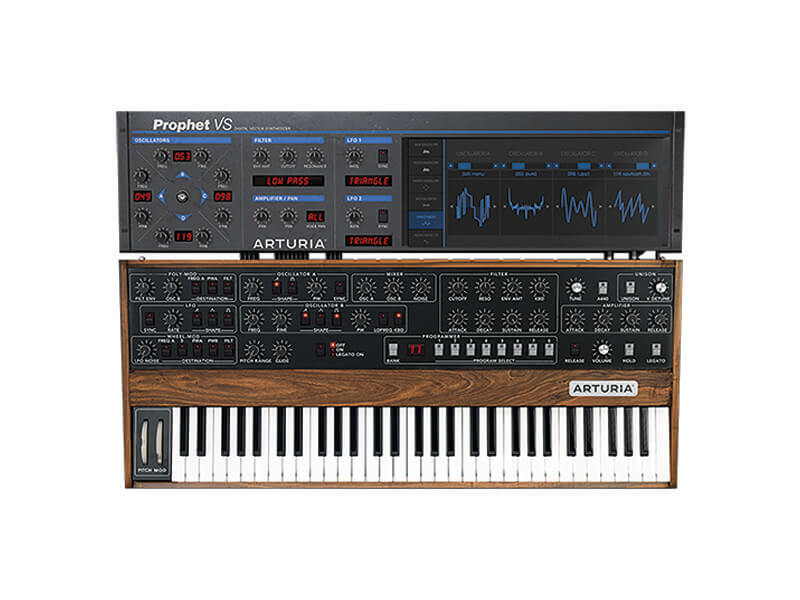 This plug-in from Arturia offers a software clone of the legendary Prophet-5, while also offering a clone of the vector-based Prophet VS, alongside a hybrid sum of the two! These Arturia plug-ins have a very good reputation and sound excellent. Another classic from the vintage vaults, the original Wavestation SR was something of a vector star back in the early 90s. 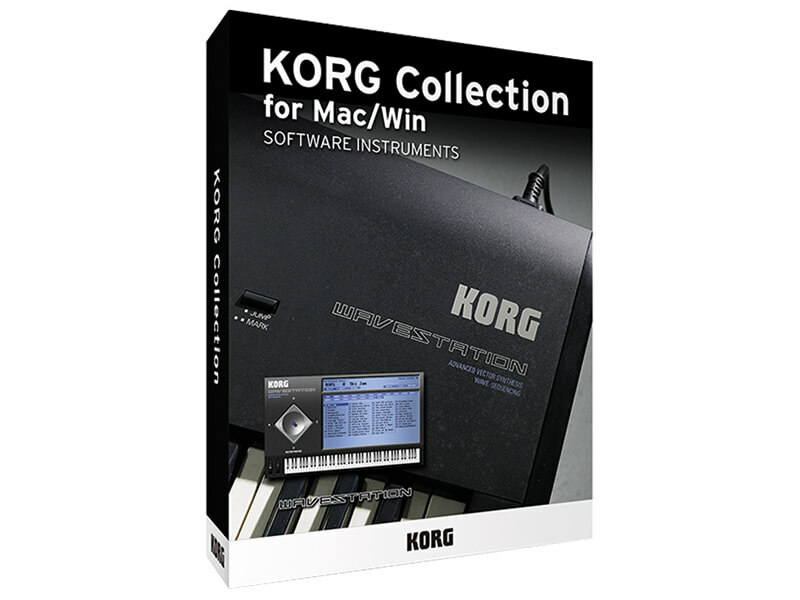 Thanks to Korg’s attention to detail, this plug-in offers a superb facsimile, wave sequences and all, but without the incredibly noisy outputs that plagued the original. This is a really exciting and very powerful plug-in synth, which offers a pretty bewildering amount of sonic possibilities, while being intuitive to use.